@Manila | Get Your Grub On! Finally, after being already three days in Manila my colleague and friend took me out for some proper filipino food at ‘Gerry’s Grill’ at Greenbelt. 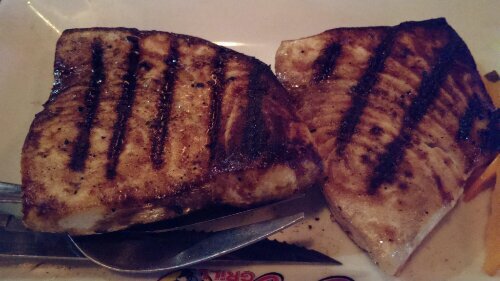 It’s a chain restaurant but offers a big selection of traditional dishes and so we started up with the only remotely healthy dish of the night, the ‘Grilled Blue Marlin‘ which was delicious. It was lightly seasoned, charred out- and moist inside. Awesome fish. 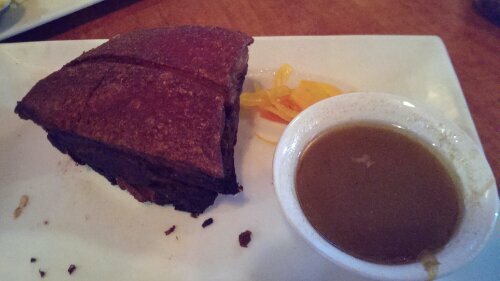 We also had the ‘Adobo Pork Ribs‘ and I gained a couple of pounds just looking at them. The best about this was the extremely crisp skin on top and the juicy tender meat on the bottom. Unfortunately there were really thick layers of fat in between that after the second sinful bite I was feeling a bit uncomfortable, greasy and all. 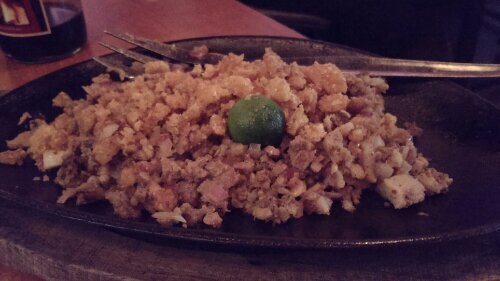 Another but better type of grease was the ‘Sizzling Sisig‘ which was a kinda hash from pork cheeck, pork fat and roasted pork skin. That all drizzled with lime juice, the filipino version of Maggi and hot sauce tasted pretty amazing. Sinful for sure but together with some rice this was brilliant especially because of the different textures and it’s porkyness. If you feel like pork and crackling this is a good choice that won’t disappoint but the atmosphere here is rather TGIF’s-like and it gets quite loud when they later in the evening turn up the volume of the rock concert videos that are endlessly running on many TVs all over the restaurant. We pretty much ended up screaming at each other. I was going on a business trip to Manila and would normally look for some local food options when traveling but since there was no Filipino restaurant anywhere to be found in or just around the hotel, I tried ‘UMU’ the Japanese restaurant in the lobby. I started with a slap of ‘Maguro Sashimi‘ (tuna) which was soft, tasted fantastically pure and drizzled with calamansi juice just became something else. A good start. I don’t know why but I really like ‘Ebi Sushi‘ (cooked prawn), no specifically extraordinary taste but the perfect texture makes me order these nearly every time I’m in a Japanese restaurant and the ones at ‘UMU’ where some of the best I have ever had. They were clean, huge with a great bite and stuck to the rice perfectly. I loved them. I wanted to keep it a tad healthier so I resisted my desire to order the ‘Agedashi Tofu‘ and ordered the ‘Hiyayakko‘, a cold tofu dish, instead. It was a lot but the beancurd tasted nicely milky and mixed with the chopped scallions, grated ginger and dipped into tempura sauce it honestly was really really nice. ‘UMU’ is a stylish setup place with Japanese interiors and designs, very friendly waiters and some fantastic dishes that will probably make me return here in case I should come back to the Philippines anytime soon.